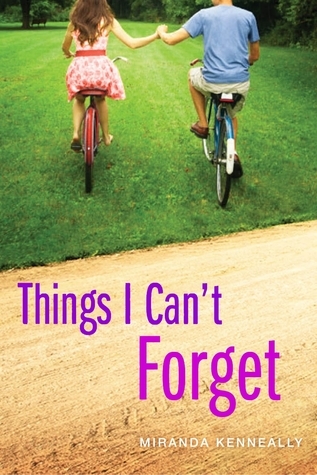 Things I Can’t Forget is a story about Kate, the good girl who has to make some tough decisions in her life. Summer time comes and Kate sets off to work as a counselor at the local camp. There she meets a boy from her childhood, Matt, who is no longer how she remembers him. Together, these two must overcome their own insecurities and make choices that will change their lives forever. You guys all know I adore Miranda’s writing. Her characters are what drives her stories and I love that. Kate is unlike your typical heroines. She is a good girl and she’s not ashamed of it. I loved that about Kate because so often, it’s the bad girls who get all the attention. Even though she had some things to work through, I loved that she took a stand and stayed true to it. Now Matt, oh darling Matt. I swear Miranda cannot write bad male leads. I have loved Henry and Will to pieces, and Matt is no different. He is also a good boy and he’s not afraid to be. I think this is the part of the book that I love the most; the fact that you can be the “good” child with strong convictions and be happy. You don’t have to be rebellious and such to have fun. I loved Kate and Matt together and I really enjoyed seeing the mutual respect between these two. For how young they are, they acted mature when it came to their relationship and it was great to see. Yes, this book wasn’t all beds of roses, but it was well written and showed different aspects of teenage life that people may not think about. Things I Can’t Forget is a sweet story of standing up for what you believe, loving with your whole heart, and being who you are. The book comes out March 1st!